Every July 4th, you hear a whole lot about American whiskey, and with good reason -- drinking bourbon and rye from the good ol' US-of-A is a pretty terrific way of celebrating our independence from the gin-guzzling Brits. Every July 4th, you hear a whole lot about American whiskey, and with good reason -- drinking bourbon and rye from the good ol' US-of-A is a pretty terrific way of celebrating our independence from the gin-guzzling Brits. It doesn't hurt that whiskey, rye at least, has a connection to the birth of our country. George Washington ran a rye distillery at Mount Vernon. The Declaration of Independence was written on peeled-off rye whiskey labels. Patrick Henry said, "Give me rye or give me death." OK, so those last two aren't true. But neither is the myth that whiskey was what Americans were swilling when America became America. George Washington may have distilled rye, but what he requested at his first inauguration in 1789 was a bottle of rum. Colonial-era Americans drank a lot of rum, more than any other distilled spirit. Back then, a lot was a LOT -- according to one report, per capita consumption for the over-15 set back in 1790 was five gallons of distilled spirits (compared to less than two today), and that's not counting all the beer, cider and wine they guzzled. What a lot of folks don't know is that they were also making rum. A lot of it. The very first distillery established in the colonies, back in 1664, made rum. (It was on Staten Island. Go figure.) As a matter of fact, New England was the rum center of the world for a while in the 1700s, and rum was the biggest industry in the colonies. The end of the slave trade and British control of molasses-producing Caribbean countries killed the rum biz in the States by the middle of the 1800s. But today, American rum is a bonafide thing again, thanks to a whole lot of dedicated craft distillers in the Original 13 and throughout the more newfangled states as well. Here are nine of my favorites; I guarantee there will be a lot more springing up over the next few years. Now, let's tip a glass to America -- land of the free, home of the rum! BUSTED BARREL ARTISAN DARK RUM (New Jersey; 40 percent ABV, no age statement, $35). You may not associate booze-making with New Jersey, and for a reason -- Busted Barrel is the first legal distillery in the state since Prohibition. And New Jersey might not be the first place you associate with rum, but Busted Barrel's is really quite fine. Made in an old school copper pot still, It's got an earthy nose almost reminiscent of a rhum agricole, and on the tongue it's dry, quite nutty and a little funky. There's no age statement to this one -- I'm guessing it hasn't been aged for very long -- but I'd love to check it out again after a few more years in wood. As things stand, it's already a contender. Busted Barrel's white rum is also worth trying, and they both make great mixers. FRESHWATER MICHIGAN AMBER RUM (Michigan; 40 percent ABV, aged at least six months, $32). From the geniuses at New Holland Brewing who distill Beer Barrel Bourbon and Hatter Royale Hopquila, here's a rum from Michigan, of all places. It's matured in used wine casks, second-fill bourbon barrels and virgin oak, which gives it a rich and slightly fruity flavor. This is pretty close to the Caribbean styled rums we all know and love, but it still has its own distinct American vibe. And the vibe is delicious. Michigan Amber is nice on the rocks or in cocktails, but sip it neat to really appreciate the complexity. KOLOA KAUA'I DARK RUM (Hawaii; 40 percent ABV, not aged, $40). Hawaii is a tropical island. Therefore there should be a ton of Hawaiian rum out there, right? 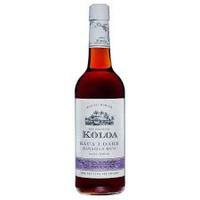 Actually, for whatever reason, no; Koloa didn't start producing rum until just a few years ago. They distill from crystallized brown sugar (from native sugarcane) rather than traditional molasses, and the dark rum isn't actually aged at all. The flavor comes from the caramelized sugar which gives it such a deep, rich color, along with various spices. This is a big, flavorful rum with rich coffee, caramel and dark chocolate notes that remind me a little bit of a blackstrap rum like Gosling's Black Seal. It's a nice sipper and of course it goes great in tiki cocktails. OLD IPSWICH TAVERN STYLE RUM (Massachusetts; 40% ABV, aged about 1 year, $25). Old Ipswich is a recreation of an old-school 18th century New England rum, made by two history buffs who'd uncovered the history of rum distilling in their hometown. Now, New England rums tasted different from the Caribbean rums we know today. They were dry, austere, no nonsense -- kind of like the flinty, dour Calvinists and Puritans who first settled the colonies. They were generally aged only as long as it took the barrels to travel to wherever they were headed, which was usually weeks or months. Old Ipswich is distilled entirely in a pot still and aged in new charred American oak. It's quite dry; almost whiskey-like, with a nice slightly smoky finish. I love this rum -- there's something very straightforward and honest about it. I can almost see the docks, smell the sea air, hear the seagulls overhead, feel the cobblestones beneath my feet. And that's before my second glass. OWNEY'S ORIGINAL NEW YORK CITY RUM (New York; 40 percent ABV, not aged, $40). When I first wrote about made-in-New York spirits a few years ago, I was dismayed to find there weren't any homegrown rums. Thankfully, former financier Bridget Firtle has taken care of that situation. Made in Brooklyn from non-GMO molasses, this is an un-aged rum that can stand proudly alongside just about anything from the Caribbean. It's got a lot of vanilla and molasses up front, a little bit of coconut in there too, and a sweet finish that almost reminds me of a white dog whiskey. I wouldn't recommend sipping it neat, but it's quite flavorful on the rocks, and it makes a hell of a daiquiri. PRIVATEER TRUE AMERICAN AMBER RUM (Massachusetts; 45 percent ABV, aged 18-24 months, $35). Privateer founder Andrew Cabot has rum making in his genes -- he's the descendant of another Andrew Cabot, an 18th century rum distiller and, yes, privateer in the War of Independence. The amber rum is true to the spirit of classic New England distilling, but it also utilizes some modern touches, including aging in a dizzying array of both new and second-fill casks. The result is gloriously smooth and complex, with vanilla and caramel notes segueing into dry tobacco and peppery flavors. Add an ice cube and the sweeter flavors come to the fore; personally, I prefer it neat for more of a New England vibe. The American rum renaissance is still in its infancy, but it's already a force to be reckoned with, and here's the proof. RAGGED MOUNTAIN RUM (Massachusetts; 40 percent ABV, no age statement, $32). This is a real New England rum -- almost ascetic in its bracing dryness. There's no age statement but judging from the golden amber color I assume it hasn't been long, given the spiciness on the finish. Put it on the rocks, however, and a lot of vanilla and fruity sweetness comes out. For students of American history who want to study with their taste buds, Ragged Mountain is a must-try. ROGGEN'S RUM (New York; 40% ABV, no age statement, $50). This may be a tough one to find because it's a limited edition that's infrequently made, but the folks at Tuthilltown Spirits (who also make some fine whiskeys and bitters) have been making noises about getting more into rum, and let's hope they're not just blowing smoke. This is a big, dry, powerful rum, aged in both new and ex-bourbon oak, that stands up and makes a good accounting for itself even in the most complex tiki cocktails. Not exactly the way our founding fathers drank rum, but your mai tai will thank you for adding a little Roggen's. 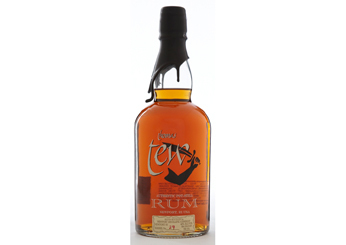 THOMAS TEW SINGLE BARREL RUM (Rhode Island; 42percent ABV, no age statement, $30). When America was Rum Central, Rhode Island was at its epicenter, boasting almost two dozen distilleries shortly before the Revolution. But when Newport's Thomas Tew, named after a famed locally-based 17th century pirate, made its debut in 2008, there hadn't been so much as a bottle made there for well over a century. Thomas Tew helped kick off the American rum revival, and it's still one of the very best. Pot distilled from blackstrap molasses, it's dark and rich, full of vanilla, molasses, toffee, and drier earthy notes that keep it beautifully balanced. The finish is long and satisfying and almost begs you to sip it again. You could put it in a cocktail or add ice, I suppose, but it's a terrific sipping rum that doesn't need anything -- except, perhaps, a glass.